Some of the programs we use on our desktop or laptop computers have subscription services associated with them. An example is Evernote Premium. Perhaps you signed up for premium service on your iPhone, and subsequently began using the product on your laptop or desktop computer. Now, almost a year later, you’re cutting back on some of the many unnecessary monthly and annual fees that can really add up to a lot. So, you’re wondering how to cancel a subscription. You can follow these steps to review and cancel subscription services being paid through Apple iTunes. It’s a great way to discover hidden ongoing payments you may have long forgotten about. These instructions assume you have the latest iOS software update on your device and you’ve signed into your iCloud account on your iPhone or iPad. On your iPhone or iPad, go to Settings. At the top, tap on your name to access Apple ID, iCloud, iTunes & App Store. Tap on iTunes & App Store. Tap on your Apple ID displayed at the top of the screen. Choose View Apple ID from the pop-up list. Tap on Subscriptions (you may need to scroll down). You will have now discovered a treasure trove of monthly and annual subscriptions you’ve been paying perhaps without knowing. Tap on any subscription for more information or to cancel. Be careful to only cancel subscriptions you’re sure you don’t need. You don’t want to inadvertently cancel something and then later realize that you were using some feature or enhancement provided by the subscription. I just met with the team at TKIowa and am thoroughly impressed with the array of right sized technical staffing and solutions they offer. I’ve been in the Iowa City area offering technical services for over 30 years, and in all that time haven’t seen such a comprehensive and organized shop. Although TKIowa is a relative newcomer it’s to their advantage because they have avoided the extra baggage of legacy technologies and overhead. As a web designer, I’m always interested to see what the competition is doing. I know of a few really nice web design teams in the Iowa City area and surrounding communities. Today I added TKIowa to that list. The principal of the business, Mo, showed me a few of their recently completed sites and the work is really exceptional. It’s not enough to simply have a responsive or mobilized site these days. You want design and interactivity that are attractive, engaging, and result in desired outcomes — be that donations, sales, new members, subscribers, followers, or whatever your goal is. The team at TKIowa builds simple, elegant, effective sites that produce results. I’d highly recommend considering them for a site renovation. You’ve probably heard of Microsoft Office 365, the $99 per year subscription service that includes the full suite of Microsoft’s latest Office 2016 software, plus some other software. Is an Annual Subscription a Good Deal? Most people think of subscription services as a rip-off. Instead of paying annually, they’d rather purchase Microsoft Office for about $130 as a one-time purchase and keep it forever. However, every 2 or 3 years Microsoft releases a new version and it’s generally a good idea to stay current. Here’s what you get for the $99 per year subscription fee to Office 365. Using the Microsoft Office 365 subscription, you can install the above software on 5 computers (a $3,475 value), or share the subscription with four other people (or any mix of installs and shares). When you share with others, they can install on 5 of their own computers or devices. So, if you use the purchasing user account for one of the installations (required), then share your Office 365 subscription with four people, there can be a potential for a total of 21 computers to have the full suite of software listed above. for a total of $14,595 in value for only $99 per year. Keep in mind that the intention of the Office 365 license is to share among people in the same household or family. It’s not for business use or sharing with acquaintances. Each person with a shared account needs to login on their 5 computers with their own Microsoft account to activate the software. Other than this limitation, for those who are able to take full advantage of the subscription, it’s a great deal. The video below provides an overview of Office 365 features. The entertainment industry spends millions of dollars to create the movies and television shows we enjoy. Actors, producers, directors, filming crews, set designers, stunt people, and other contributors get paid. Through theater ticket sales, rentals, and DVD sales, the cost of producing movies is recovered. When people illegally obtain, copy, and re-distribute videos, it harms the entertainment industry. The costs that might otherwise be spread across many consumers becomes a burden shifted onto those who obey the law. Some pay nothing, and the rest of us make up the difference. It’s simply not fair. Those who skirt the law, console themselves with the notion that they are ‘sticking it to the man’ by not letting their money go to the big corporations and millionaires at the top of the entertainment industry pyramid. It’s certainly disconcerting in any industry to see such large discrepancies between the super rich, and the working poor who’s backs their wealth is made on. However, stealing isn’t the answer. The remainder of this document is intended to provide information about technologies intended for the fair use of copyrighted movies and other media. Please do not use this guide for illegally copying and distributing media. Purpose. The purpose and character of the use, including whether such use is of a commercial nature or is for nonprofit educational purposes. Nature. The nature of the copyrighted work. Amount. The amount and substantiality of the portion used in relation to the copyrighted work as a whole. Impact. The effect of the use upon the potential market for or value of the copyrighted work. An example of fair use might be the playing of a short video clip from a longer movie in class. More information is available in the Wikipedia article on Fair Use. Because people will inevitably seek out ways to break the law, those in the entertainment industry have sought out ways to make it more difficult to break the law. It would be like the automotive industry making cars that won’t go faster than 80 miles per hour to prevent people speeding beyond the maximum allowable highway speed. So, in the same way technological barriers are put in place to make illegal copying of media very difficult. Unfortunately, this inhibits the legally protected fair use of media. Technologies are available for those willing to comply with the fair use guidelines above. Keep in mind that a gray area is point #4 regarding the financial impact. For example, it’s conceivable that the production costs of a movie might be recuperated through theaters, DVD sales, television ad revenue, and services like Netflix. Prices are set accordingly, and the various delivery methods are protected. One of the more common uses of copied media, that isn’t directly addressed in the fair use guidelines is the copying of purchased media for personal use in another form. No profit is being made and presumably it’s not impacting sales. Here’s the possible argument against making alternate forms of purchased media. If you purchase a DVD and then copy it to your computer to be played on your iPad, you might think you’ve not impacted the financial revenue of the movie. However, the income from streaming delivery sales through services like Netflix produces revenue. Having an alternate viewing experience (on the iPad rather than using a DVD player) is something that the production company may have planned on making money from. So, by not watching a movie on Netflix, and instead copying your DVD to your iPad, you may be impacting revenue. The counter argument to the above is this… Copying your DVD to your iPad certainly does not have the same financial impact as someone who is copying videos and redistributing them on a massive scale. Given that streaming data speeds are limited, and data plans are very costly, it’s unlikely that anyone would watch a full-length feature movie very far from WiFi. In other words, making one’s own movies for use on an iPad while mobile is not cutting into Netflix or other online streaming video revenue. So, it could be argued that it’s within someone’s right to make an alternate form of a purchased video. Indeed, some DVDs come with free access to a streaming version of the movie — perhaps a copy you can download on the Google Play store or in your Amazon account. Give the context and legalities described above, here is a software solution for working with copyrighted media. Purchase Wondershare Video Converter Ultimate. Visit the ProtectDVD.com website to obtain the free DRM and DVD copy protection plugin. * Warning: Inappropriate use of this software could result in prison time and thousands of dollars in fines. Cameras, video recorders, scanners, wireless network adapters, printers, and other devices typically come with included software from the manufacturer. Here’s a quick list of points to consider when trying to decide what software to use. Limited. Sometimes limited software will ship with a device. This means that it will do most tasks and functions okay, but you may end up wanting to purchase a version with more features. Open Source. An LP turntable (record player), for example, might include Audacity software which is open source. It’s free, but support may be limited. Proprietary. Some vendors include their own proprietary software. Canon or Sony video recorders may come with video transfer and editing software that’s proprietary to those companies. Such software may have nice features which become the determining factor in a purchase. A customer might purchase a Canon video recorder because they really like the included software. Benefits. The benefit is that it’s free and supported by the manufacturer. It’s usually more likely to be compatible with your device. When getting support, the manufacturer will be more willing and able to help if the hardware and software is their own. Drawbacks. The drawback is that sometimes manufacturers discontinue a software program, or switch to a different one — perhaps contracting with a different company to develop a solution. If you need to move to another software program, it might not be easy to get your projects or data transferred. Third-Party. Some vendors will include the full version of commercial software. For example, it’s typical for scanners (or multifunction devices) to come with scanning software from the manufacturer, but the OCR (optical character recognition) software may be a full-version of commercially available software from a third-party (such as Readiris). Benefits. The advantage to using commercial software is that there will likely be future versions released and support may be better. Many commercial software programs are designed to work well with others, so importing or exporting information may be easier. If it’s broadly used, then there may be more resources such as online forums where you can get answers or suggestions. Trial. Some devices come with trial software that will stop working after a certain time period such as 30 days. Benefits. You get to try some software and see if you like it. Drawbacks. You’ll need to purchase the software to continue using it. Trojan. Sometimes a manufacturer will ship software with a device and the software includes other programs that are installed as well. Usually the vendor gets paid to sneak other software in without the user being aware. There will generally be some fine print explaining that you’re agreeing to other programs being installed on your computer. So, be careful when you’re installing to make sure you’re only installing the necessary software. Some equipment comes with software on a CD or DVD. Others require that you download the software. For many, you get a CD and can also download the software if you wish. With a download, you’re certain to get the latest software that’s ideally suited for your operating system and device. However, on occasion, the downloaded software isn’t as fully featured as the software on the CDs. This may be because third-party providers don’t want their software publicly available for download. For example, a scanner may come with drivers, scanner software, and third party software such as ReadIRIS OCR software. When you download the software from the manufacturer, you’ll get everything except for the ReadIRIS software. For multi-function devices, the downloaded software may include additional software that wasn’t originally included on the CD. So, it really depends on the circumstance. Here are considerations for various devices. Audio Recorder. For a long time, Sony and Olympus audio recorders came with proprietary software from the manufacturers. You couldn’t get the audio off the recorders without the correct software. A problem people would have is that after a few years, the software wouldn’t be supported by the manufacturer and the old software would no longer be compatible with new operating systems. So, you’d be stuck with a non-working audio recorder, or you’d need to stay with Windows 98 in order to keep it working. Newer audio recorders can be read on any computer using a USB cable without any special drivers or software. They record to MP3 audio files, so no conversion is needed. Cameras. Most cameras don’t need any special software. However, compatibility could be an issue. For example, on Apple computers, you’ll periodically see updates that are intended to allow the computer to recognize more cameras. That’s good news, but it also means there are still some that aren’t recognized. Fortunately, with photos and videos recorded to memory cards, you can access your photos and videos by other means. Network Cards. Network cards, and especially USB wireless network cards, almost always come with drivers and special software. Often you’ll have a choice when installing to select drivers only, or drivers and software. If you select drivers only, you’ll be using the Windows software to connect to wireless networks. That’s a familiar interface. If you use the manufacturer’s software, you’ll have something new to learn, and it’s one more layer of complexity installed on your computer that could break down. The only reason to use the manufacturer’s software would be to take advantage of some special features. Maybe their software does something special. For example, diagnostics of signal quality and power would likely be better. Printers. Printers typically come with drivers, software, and third party utilities (if you have a multifunction printer). When you plug your printer in, your Windows or Apple computer should recognize it and allow you to do basic printing with the software you already have as part of your operating system. Some people prefer this because it reduces the software installed in your computer resulting in less to break down. Other people prefer to install all the software available for the printer. Often during the installation process, you can choose how much or how little you’d like to install. Software included with the printer may provide added features for checking ink level and being notified of the printer status. Scanners. Scanners typically come with drivers, software, and third party utilities. It’s sometimes possible to avoid using all of these. When you plug your scanner in, your Windows or Apple computer should recognize it and allow you to do basic scanning with the software you already have as part of your operating system. Some people prefer this because it reduces the software installed in your computer resulting in less to break down. Other people prefer to install all the software available for the scanner. Sometimes this even includes photo album making software. Often during the installation process, you can choose how much or how little you’d like to install. Video Recorders. It’s still true that some models of video recorders, such as some from Cannon, require special software. For example, with Cannon, you may need special software and drivers or the camera won’t be recognized on Apple computers. However, most cameras don’t require special software. You can connect them to any computer, and immediately view or edit the MP4 video files. It’s good to check ahead of time about compatibility. The AVCHD video format for HD video is becoming more accepted by various computer programs. In the past, it was a difficult format to work with. Here are some specific examples of software to consider for use. Computers (and external hard drives) often ship with included backup software. The software is free, and typically works okay. With Western Digital hard drives, for example, the free software is full featured and there’s nothing more to buy. However, with Dell, a person must pay for the Dell Backup and Recovery Premium software. What’s ironic is that backup software often doesn’t do anything beyond what the built-in Windows backup program already offers for free. With any specialty software, you need to ask yourself one simple question. If your computer indeed does crash, and you replace it with another from a different manufacturer, how would you ever get the backup software again? Is it available for sale in the store or online? Typically the answer is no. So, if you want your files back, you’re locked into purchasing from the same manufacture again — in hopes that they still offer the same software they did several years ago. Ultimately, a person is better off paying for commercial backup software or paying for a backup cloud service if they need some features beyond what Windows already offers for free. Software like Acronis True Image can provide a backup solution with more features than a typical Windows backup. Below is a screen shot of the offer you’ll see on a Dell computer for the Dell Backup and Recovery Premium software. The Download.com website managed by CNET has become the primary website for software downloads. Many companies use it as the only portal for delivery of their software. However, the site has been identified to use misleading and potentially harmful advertising. So, it’s important to be careful when using the site. One of the problems to be mindful of is the software download and installation utility. When using it, if you’re not careful, you’ll agree to having other software installed on your computer and having settings on your computer changed. Your default search provider would be changed to Yahoo on Safari, Firefox, and Google Chrome. Be sure to read the small print. You’ll need to click on the Decline and Close buttons whenever asked if you want to install the additional software. 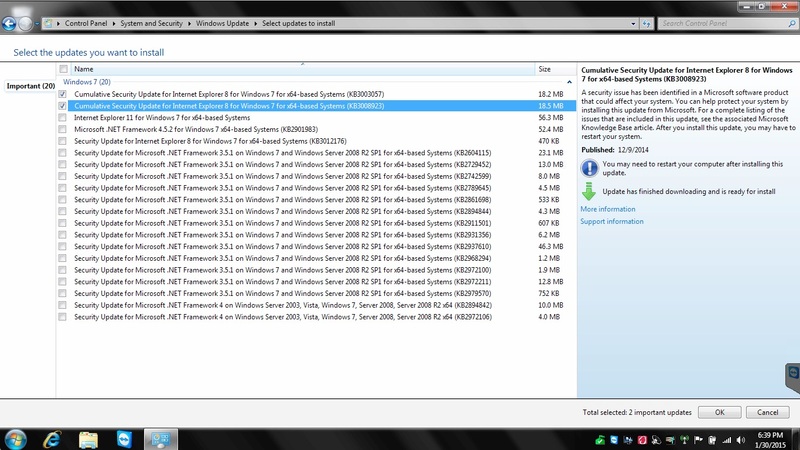 Here are the screenshots you’ll see during installation. Click Next Step to continue to the screen shown below. On this screen, you need to Decline or Accept having Yahoo set as your default search engine. 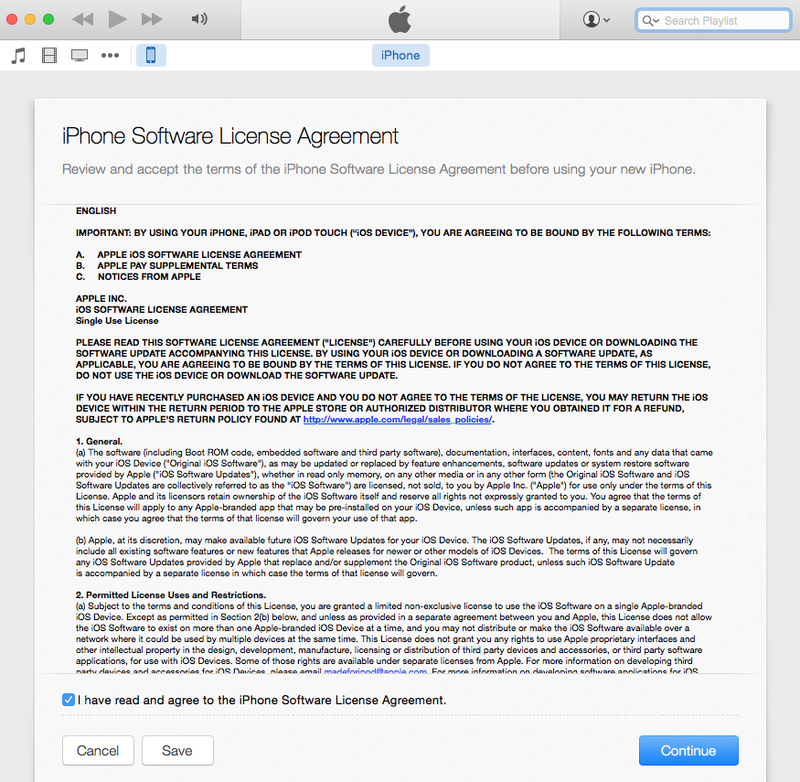 The screen is configured to look like a typical License Agreement or Acceptance of Terms. Most people will just click Accept and not read the fine print. You should click Decline to avoid having modifications made to your search settings. When you click Decline, you’ll continue to the screen shown below. The screen shown above, is written to look like a typical installation screen. However, it’s a confirmation screen to have MacKeeper installed. The Install button will install MacKeeper. The Close button will continue with the installation of the program you intended to install. The following screens for steps 3 and 4 are relevant for the software installation. Follow these instructions if you’re upgrading or replacing an iPhone. Backup. Backup your current (old) phone using iTunes. You may already have an iCloud backup, but a local backup will be a faster method. This will require synchronizing the phone which may involve transferring purchased or upgraded apps to or from the phone. You may also be prompted to perform any updates for the phone. It may be faster to use iTunes (and a fast Ethernet connection) to download the latest updated apps. Once everything is updated in iTunes and on the iPhone, and backed up, you are ready for the next step. Logout of iCloud. Logout of your iCloud account on the iPhone. Without doing this, Apple will still have a record of the phone as being assigned to your iCloud account and nobody else will ever be able to use the phone until it is deauthorized and disconnected. Secure Erase. From Settings > General > choose to Reset all data and settings. Restore Backup to New iPhone. You can now restore the backup made in step #1 to the new replacement iPhone. Start iTunes and connect the phone. You’ll see a message in iTunes stating “Welcome to Your New iPhone” and “Restore from this backup” will have the most recent backup selected. You may also see a message stating that an update is available for the phone. You screen may look like the one below. Click the image for a larger view. License Agreement. Accept the license agreement by checking the box and clicking Continue as shown below. Click the image for a larger view. Restore Progress. You’ll see a message, “Restoring iPhone from backup” with the estimated time remaining as shown below. The time remaining may fluctuate during the restore process since it is an estimate based on the current transfer process. Restart. After the iPhone is restored, it will be restarted. Available Updates. Even though the phone is new, you may be reminded of available updates. It’s common that new computers and devices need updates after purchase. Examples of update notifications are below. You can ignore or cancel these for now. If you have an option to download only, you can choose that. Initial Setup Wizard. When your phone has restarted, it will still say “Hello” as if it’s a brand new phone. This is because the initial startup sequence hasn’t run yet. Walk through the navigated guide to perform the initial setup. You can setup the touch ID (fingerprint access) during the phone setup process, or you can do it later. Account Passwords. You’ll be asked to enter the passwords for all your email accounts, social networks, and other online accounts. This is to avoid someone restoring your backup to a device and having full access to any accounts with saved passwords. Synchronize Apps. The restoration process will involve copying all apps from iTunes back to the iPhone. The reason this happens is because the iPhone backup does not seem to make an extra copy of the apps during the backup process (since they are already in iTunes or available in the cloud). So, the iPhone backup contains your unique user settings and data. The synchronization process may take a while if you have many apps and/or larger apps. Google Accounts. For Gmail accounts that have additional security measures enabled, you may need to generate a password from the app passwords generator. These are found under your Google Account security settings. You can delete (revoke) any previous access codes generated for your old phone. Facebook. For Facebook accounts that have additional security measures enabled, the Facebook app may prompt you to enter a uniquely generated password key that will be sent via SMS. Update. After your phone has completed the initial synchronization, this would be a good time to perform the iOS update if available. Even if your old phone had the latest iOS, your new phone, even though restored from a backup, may not have the latest iOS, and since this isn’t part of the backup/restore image the update will need to be done manually. You can perform an iOS update from within the phone under Settings > General > Software update. Or, you can do it from within iTunes under the iPhone page. Disable iPhoto Launch. 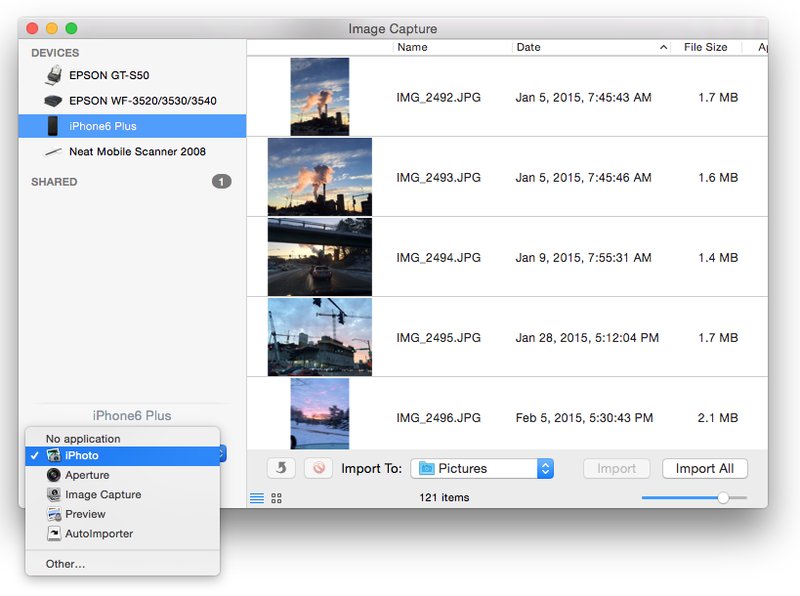 By default, your phone may automatically launch iPhoto when it is connected to your Apple computer. 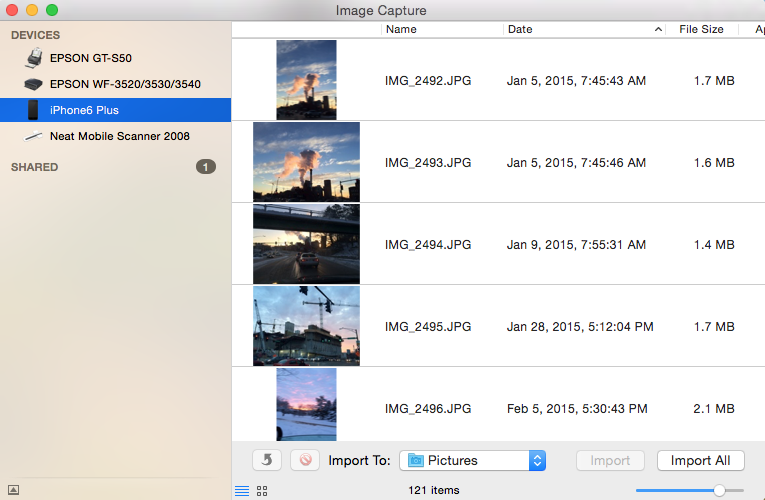 To disable this, close out of iPhoto and open Image capture from the Applications list. Select your device, and then expand the options window in the lower left corner by clicking the tiny triangle in the box as shown below. Click the image for a larger view. From the options menu, under “Connecting this iPhone opens” choose “No Application” from the drop-down menu as shown below. Click either image for a larger view. Connection Error. At some point along the way you may see a connection error like the one below. If so, click the OK button. Exit iTunes and start again. You should be able to connect. Make sure the phone is on and logged in when starting iTunes. Backup. 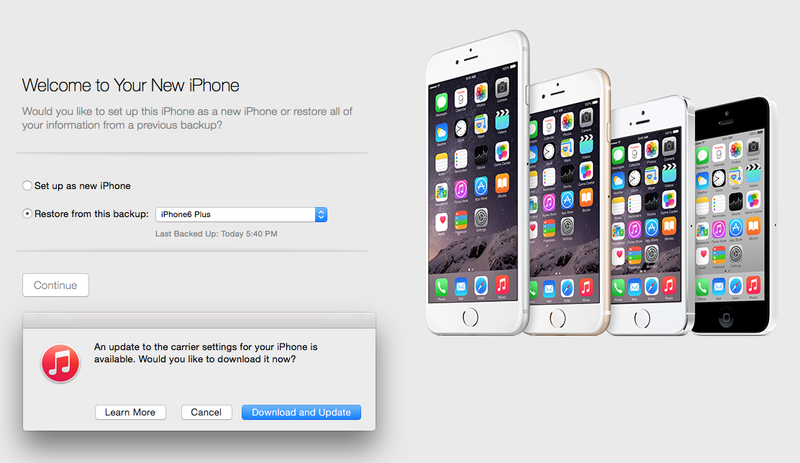 After performing all of the above steps, you may not yet have a backup of your new device. From within iTunes, on the device page, under Backups, choose to backup to ‘This computer’ and click on the ‘Back Up Now’ button under ‘Manually Back Up and Restore.’ Click the image below for a larger view. At this point, you new phone should be setup, backed up, and ready to use. For many years, Microsoft has issued updates for their software in numerous independent update patches. Even in the Apple Mac environment, software like Microsoft Office 2011 requires many updates after a clean installation. The most problematic issues arise with Windows updates. If you have a computer that’s several years old, and you need to perform a system restore (back to factory settings), it will be necessary to install the many hundreds of updates that have been issued since the time the computer was manufactured. If you follow the prompts to install each batch of updates, which can often be over 100 at a time, some of the updates will conflict with one another. Some updates will be irrelevant. This process is hugely time consuming, and could render the computer useless with repeated bluescreen errors and system failures. At some point along the way, the system update window may indicate that the computer is up to date. This may be incorrect information. Keep persisting. Restart the computer, and then from the updates window, click the Check for Updates link. It’s common to have many updates, and then have a large Service Pack to install, which has hundreds of required updates. Even with a brand new very expensive Windows 8.1 computer, you may find that the computer stops working after installing the suggested Windows updates. The screenshot below is a good example of the problems described above. Click the image for a larger view. Notice that there are multiple updates for Internet Explorer 8 as well as an update/upgrade to Internet Explorer 11. There are also updates for multiple versions of Microsoft .NET Framework. Most software vendors are able to provide an updated version of their software that includes any updates since the previous major release. With Windows, a major update like a service pack should be able to include all the updates since the previous service pack. If the Internet Explorer 11 update is installed, then this makes the Internet Explorer 8 updates unnecessary as shown in the notice below. 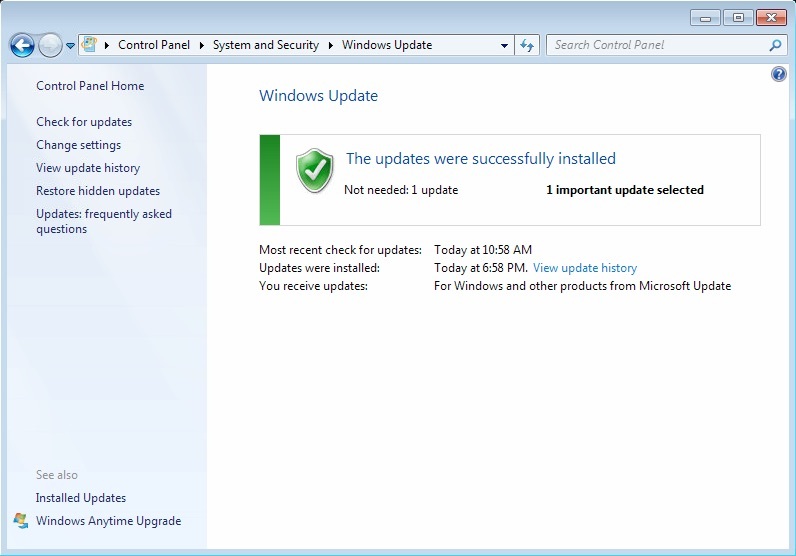 The best way to avoid conflicts, failures, and errors with Windows Update is to scroll down to the bottom of the list of available updates and select only 5 to 10 updates at a time. Notice that the checkbox at the top of the list will select and deselect all updates. You can use this first to deselect all updates, and then scroll down and select 5 or 10 updates to install. After each batch, you will likely be prompted to restart the computer. This process can take many hours. A: Despite the abundance of people using browsers, this is still a common question. A browser is a program that lets you go to a web page and otherwise explore the Internet. Browsers let you interact with social network sites like Facebook, Pinterest, or Twitter. Unless you’re reading this as a printed page, you are most likely viewing this page with a browser. You can type in a website address in a browser to view that website, or you can search. Browsers generally have some form of search capability that is connected to a search engine. This is where things get a little bit confusing. The browser itself doesn’t search but it connects you, seamlessly, to a service that does. Generally speaking, a browser will have you use the associated search service (engine) offered by the browser provider. So, the Microsoft Internet Explorer browser will use Microsoft Bing. The Google Chrome browser will use the Google search service. However, you can set your browser to use another search engine such as Yahoo. Browsers let you print web pages and you can also save website addresses (called Favorites or Bookmarks). In addition to printing, you can save web pages as PDF files or as locally stored web content (saving the text and images from the page). Browser providers typically offer some kind of cloud synchronization so that your bookmarks, browsing history, and other settings can be synchronized across multiple devices. Apple, Microsoft, Google, and Mozilla offer cloud synchronization. This means you can easily pickup reading on one device where you left off on another device. Google Chrome is unique because there is a Google Chrome Web Store where you can get programs that run in Google Chrome. These are useful apps and programs written to work with Google Chrome, and in this way they can be used on Windows, Apple, Linux, and any other system that has Google Chrome. Common browsers are Microsoft Internet Explorer, Google Chrome, Mozilla Firefox, Apple Safari, and Opera. There are many others. Below are the icons for some popular browsers. Incompatible software detected. The Web Security module of Cisco has been detected, which is not compatible with Avast. To install the Avast product, please uninstall the incompatible module first. When you click the Close button, the installation will immediately quit. If you have a direct license with Cisco, you can visit the Cisco Software Download Page and download the AnyConnect Secure Mobility Client. Navigate to the AnyConnect Secure Mobility Client v3.x download page and look for the download called Standalone DMG package for Mac OS X “Intel” platforms. For many people, you will need to go to your organization or employer software download page and download the version provided. Follow the installation instructions, and remember not to select the Web Security module (see below). This will configure the software so that Avast can be installed. These are the installation screens. Click any image for a larger gallery view.